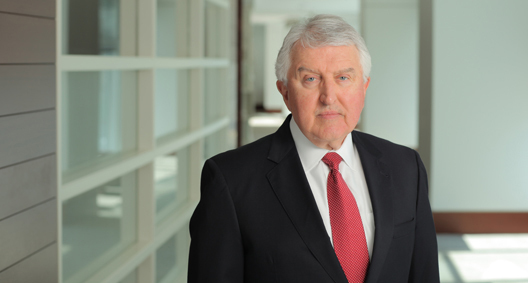 John English has been involved in energy and environmental matters since 1972. He is experienced in handling matters that affect the sale and leasing of producing oil and gas properties, commercial real estate, industrial properties, refineries and manufacturing plants. John is a frequent speaker at professional seminars on environmental topics, and co-author of Environmental Law Simplified: A Practical Guide for Oil and Gas Operations, Penn Well Books, 1993. Served as lead counsel for the seller in a $320,500,000 stock sale of a company owning producing oil and gas properties in Louisiana and Texas. Served as lead counsel in the multifirm representation of a manufacturing subsidiary of a publicly traded corporation before the Texas Commission on Environmental Quality (TCEQ) in alleged violations of state and federal clean air laws. Served as lead energy counsel for the buyer in a $36,750,000 purchase of producing oil and gas properties in Texas and in negotiating the loan to finance the purchase. Served as lead counsel on a multifirm team representing an independent producer in a $165 million private placement Sukuk financing secured by volumetric production payments from properties on the Outer Continental Shelf of the Gulf of Mexico. Represented independent producers in more than a billion dollars’ worth of purchases and sales of producing properties located in such states as Colorado, Louisiana, Michigan, Texas and Wyoming. Represented independent producers in negotiating and closing a loan secured by producing properties located in Alabama, Colorado, Louisiana, Michigan, Mississippi, Texas, Wyoming and on the Outer Continental Shelf of the Gulf of Mexico. Represented several independent producers in the sales of net profit interests in producing properties located in Louisiana and Texas. Represented an independent producer in purchasing exploration and production concessions from the Republic of Honduras and in structuring several joint ventures to explore for and produce oil and gas pursuant to those concessions. Represented several producers of oil and gas in preparing, negotiating and signing general and limited partnership agreements. Represented several investors in preparing a joint venture agreement, reviewing and negotiating loan documents, reviewing and negotiating purchase and sale agreements, and preparing closing documents for the acquisition of a coal bed gas field and related pipeline in Oklahoma. Represented working interest owners in negotiations regarding gas production imbalances. Represented unit operators in preparing and negotiating drilling contracts. Supervised and performed due diligence in several public offerings and purchases and sales of shares of exploration and production companies. Served as a member of a BakerHostetler team of lawyers representing a joint venture between two international publicly traded oil companies in acquiring petroleum storage and refining facilities located in Kansas, Texas and Louisiana. Represented the sports authority of a major Texas city in negotiations with the TCEQ about alleged violations of state and federal laws regarding hazardous substances and hazardous waste at the site of a domed sports arena. Represented an international laboratory before the United States Environmental Protection Agency regarding liability for cleanup of federal superfund sites in Louisiana. Represented an international laboratory in several matters before the TCEQ regarding liability for cleanup of state superfund sites. Served as a member of BakerHostetler’s team of lawyers representing a publicly traded national waste disposal firm in planning, conducting and reviewing environmental site assessments, and in negotiating and preparing documents in the purchase of more than 20 landfills in several states, including Texas. Represented a landowner/lessor in negotiations with a lessee regarding the removal of underground storage tanks and cleanup of land leased for service station operations. Represented a regional real estate developer in the review of an environmental site assessment and negotiations with the United States Army Corps of Engineers regarding wetlands issues. Represented a manufacturing firm in obtaining permits required by city ordinances and state and federal laws to open and operate a manufacturing facility in Houston.